This post is long overdue, but I wanted to make sure that I captured my trip to Khartoum, Sudan in a way that would do it justice. There is a lot that I’ve left out considering that I took over 400 pictures while there. That’s more impressive than you might think considering that it’s “illegal” and frowned upon by the government to take pictures out in the general public. There are restrictions regarding taking pictures of public buildings or of anything showing poverty. Nonetheless, I took a lot of great photos and I should be able to summarize my trip using food to guide the way. 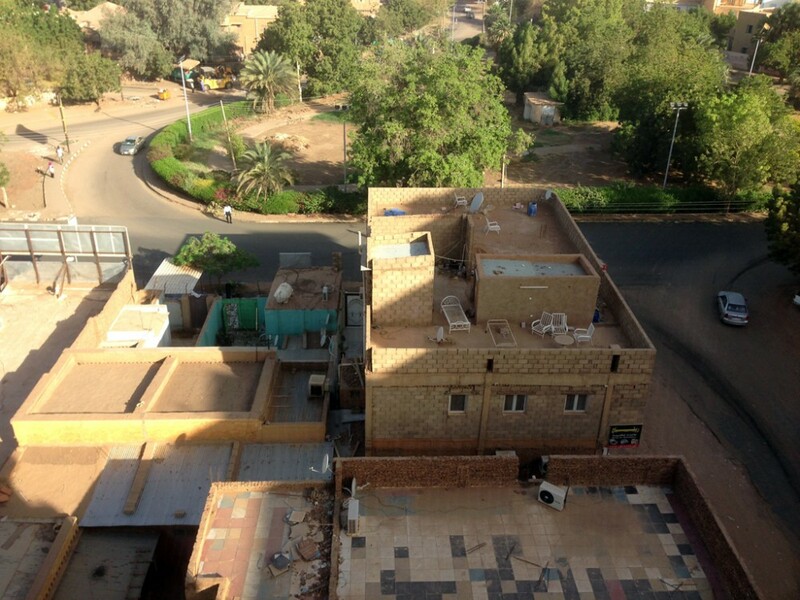 I went to Khartoum, Sudan in December 2012 to visit family at the request of my mother. Many people that know me, immediately give me confused looks when I mention having family there (you might have one of those looks on your face right now). The short story is that while my family is Coptic-Egyptian in origin (that means we’re minority-Christians, not Muslims), somewhere along the way (maybe a couple of generations back), my mother’s family moved to Sudan. She was raised there with her two brothers and I’m actually the first generation of my family born in the U.S.
Often that little tidbit of information is followed with the question, “But… why did they move to SUDAN?” Well, unbeknownst to many Americans today, Sudan at one time was more prosperous than Egypt. With both Sudan and Egypt having been ruled by the British, many Egyptians moved to Sudan at various points in time. Eventually, as the situation worsened in Sudan, these Egyptian immigrant families stayed there because Sudan had become their home. For people like my mother (at least during her childhood), her brothers, and now my cousins, this is the only home they know and they love it. One thing I learned on this trip is that when I say they love it, I really mean they love it. They’re happy there and it’s not because they don’t know any better. They have almost all of the same amenities we have. They have Samsung Galaxy III phones, wireless data internet access cards that cost less than our wired internet, and some of the largest food portions I have ever seen (see the pictures below)! We, as Americans, have this idea that everyone else on the planet is just as miserable as we are, when that just isn’t the case. We have more variety than any other country on Earth, but we just don’t have a monopoly on happiness. As is the case in many foreign countries, it seems that life runs at a slower pace there, which is in stark contrast to America’s concept of work yourself to death as fast as you can. Don’t get me wrong, America is the great country it is because of the hard work of its citizens, but we’ve definitely lost sight of the purpose of our hard work, which is to give us a better quality of life. The culture in Sudan may be tightly ruled by a restrictive Islamist government, but as a culture, the people care about one another. There is a lot of poverty there as well as war and strife, but the people help one another in a way that I haven’t seen here in America. It goes without saying that I would never want to live in Sudan, but I’d be a fool not to learn something about caring for others from how they live. I realize now that while I should be careful traveling to any “dangerous” country, the media in America has really made us all extremely xenophobic when it comes to the rest of the world. We (or at least I did) imagine that the rest of the world is as closed off as we are when it is the opposite. That probably comes from the fact that our news only focuses on ourselves and the tragedies we face internally when the rest of the world receives real “world news.” On the flight to Sudan there were many non-African people, including a few Asians, many Europeans, and even a couple of bright redheaded Irish people traveling with us. While Sudan consists mostly of black Africans, there are many non-African people that visit, live, and work there who speak both Arabic and English. Hearing Arabic come out of an Asian person’s mouth while in Sudan made me smile every time. I’m a little ashamed that I honestly did not really want to go to Sudan (even if I am completely justified in dreading the dauntingly cramped plane rides). I wanted to see my family, of course, but I wasn’t really looking forward to going to a country where the U.S. Consulate was attacked just three months before my trip. Anti-U.S. sentiment is not something to ignore when it comes to safety, but when it comes down to it, I wasn’t traveling on my own or without any guides. I also wasn’t going to the Darfur region to the West or the warring South. I had family waiting for us in the capital that was going to take us in, take care of us, and show us around. Once we arrived, I felt much better when I saw the country and realized that my family was doing just fine there. Ok… enough with the ranting. On to the photos below! Please scroll down after clicking on a photo to read a more detailed description underneath. Lion Bars are my favourite! LOL. That’s awesome you can get them in Sudan. What a brilliant post. Thank you for all the wonderful photos. Eff yes. 1 of everything please my good man! 1) This was a really enjoyable read. Ok, where to start? Obvious first question: is the food better in Sudan or Egypt? Like when I say “yellow watermelon?” Amirite? 3) How were them fusion spring rolls? 4) Bone-in is the only way to eat fried fish. Were you craving some fish sauce to go with that? How did it compare to my mom’s fried scups? 5) I’m craving some of that molokhia now. You still have to try the Vietnamese version. 6) What’s up with all the Asians there? East Asian? South Asian? 7) Thanks for misleading me into thinking you survived a sandstorm. Glad your family is doing well there. I’m kind of jealous–it’s like you have 2 motherlands to visit. 3) Fusion spring rolls were interesting. You expect spring rolls, but get Mediterranean flavors. 4) Your mom’s fried scups were better overall as a bone-in fish, but hard to tell regarding boneless. 5) Get that Vietnamese version going. 6) The Asians in Sudan are either Chinese or something else. I was told they are Chinese, but that doesn’t mean they are. I’m not sure they are very discerning regarding Asian differences there. 3) Is it almost like a substitute for phyllo? 3) These were spring rolls. They weren’t a middle eastern dish wrapped in spring roll wrappers. The filling was just not normal spring roll filling, but for all intents and purposes, they were meant to be spring rolls. So… really no substitution, just a different take on spring rolls. Food + Travel = the perfect dyad. Agashe is my absolute favourite food from Sudan, although I think it may originate in West Africa or at least from the Darfur direction. Did you manage to get a recipe for the peanut spice mix from anyone – I would love to recreate it minus the big sandpit and fire which it usually cooks around. I’m glad you had a good trip. I miss Sudan. I asked about the spice mix, but didn’t get a solid answer. I get the feeling that a lot of the cooking comes by feel rather than perfect measurement. Nonetheless, if I find out, I will let you know! As A SUDANIA, I FIND ONE THING YOU WROTE OFFENSIVE. Sudanese(north sudanese) are not black africans, this notion that anyone in Africa is black iss ignorant. I am Sudanese and seen sudanese who can pass for latino,european,arab,etc. Sudan has more than 300 tribes. ITS THE MOST DIVERSE! sudan is in north africa. And people worldwide dont have the same racial clasifications as in the USA. FOR EXAMPLE..people who are light skinned are called “White” abyad. In America its people of north african,european an d middle eastern bloodline and it changes. However, the world doesnt have the same ignorant racial classifications. We dont have this long history of slavery that America had along with dumb racial classification. One friend of mine is also sudanese and she has fair skin,full lips,wide gazelle eyes and long flowy hair. While you dont like sudan being stereotyped by conflict,you shouldnt stereotype sudanese. I can show you gorgeous sudanese women from Facebook but due to privacy issues I cant. Also know that Khartoum has many Africans of nigerian,kenyan,southern sudanese origin.Alot of southerners have grew up in he north and call it home,they speak aabic and even eat northern sudanese food and have northern friends. Alot of the non sudanese there are there for business. Like the Chinese you mentioned. China and Sudan are close. Imsorry but you are terribly ignorant. Not only am I Sudanese but I know my culture,history people than you can ever dream of. I find it hilarious you get your info about Sudan from WIKIPEDIA! LOOOL! a site that anyone can be their own “Scholar” with a simple email. Sudan never had the same history as America with the slavery that leads to a whole racial war. The Mexicans that come to the USA are usually mestizos while the European Mexicans who look German are of the ruling elite class. Im not saying colorism doesnt exist..it does! However, due to America’s history with slavery and not only slavery but jim crow laws, and how the government used to test diseases on african american men…thats unheard of here! if you knew anything of sudanese as a people you wouldnt be posting this crap. And CNN isnt a reputable source. Thank you for reading my post about my time visiting family in Sudan. I apologize if you took offense to one small part of my post, but that was not my intention. I can see how my wording on that point could be confusing. Actually, my intention was to point out Sudan’s diversity, not to imply that there are only one kind of people that live there. For many people who have not been to Sudan, I was trying to clarify that while many (not all) of the Sudanese people are dark-skinned like the way people in America may imagine, there are also many non dark-skinned people (as you described), as well as people who live in Sudan from other parts of the world who are not originally Sudanese. Thank you Man fuel but not only I. Many can and will take offense to that piece you written. Americans tend to be very ignorant. They think Spanish=Mexican Only, All Asians are Chinese,etc. So when an American sees this sudanese woman…he would think..shes not african!!! so you really have to take that into consideration that alot of times people are not ignorant,but arrogant! I have gotten into arguments in school with people who thought I was mocking Africa. They said..youre not African..you dont look African! these were caucasians too! Americans should be the last to talk about anyone when a huge portion of caucasians have black blood in them. There are soo many things that I want to say regarding the hypocrisy of Americans but I respect you and your blog. they dont even have time for their kids. Mom is working 9-5 dad is working 9-5 , they see their kids 10 minutes a day….its soo sad. But your blog is PERFECTION! AND I APPLAUD YOU FOR MAKING IT! I greatly appreciate it. I love learning about different cultures as well as my own! 1. You do realize that in your critique of America, you are equally guilty of stereotyping Americans, right? 2. I don’t deny America’s history of slavery. Do you deny Sudan’s history of slavery? Do you deny that it continues to this day? FYI, just because Wikipedia is the first hit that comes up in a Google search, doesn’t mean it’s the source I used. Thanks so much for checking the blog out. There is definitely not much out there regarding food in Sudan, so writing this felt great. Your own blog seems really interesting as you capture your travels through Africa by showcasing food. Great concept! I worked in Sudan for 3 years. I was one of the many Asians in Sudan but am not Chinese – your generalising remarks on Asians reminds me on how ignorant humans are of each other, especially those different from them. That aside, the food pics made me miss Khartoum so much. I’m glad the pictures reminded you of Sudan… Even if you felt like you needed to insult me before stating that you enjoyed the pics. I’m unclear as to what you found offensive. In the post, I never said you were Chinese or that all Asians are Chinese. In a comment to the post, I said that I was TOLD that most of the Asian people working in Sudan were Chinese, but I stated that they could have been from other countries as well. Without knowing for sure, I never made any definitive claim that every Asian in Sudan was actually Chinese.